The new cut angles to the north. The lagoon is currently held back by a small sand dam. 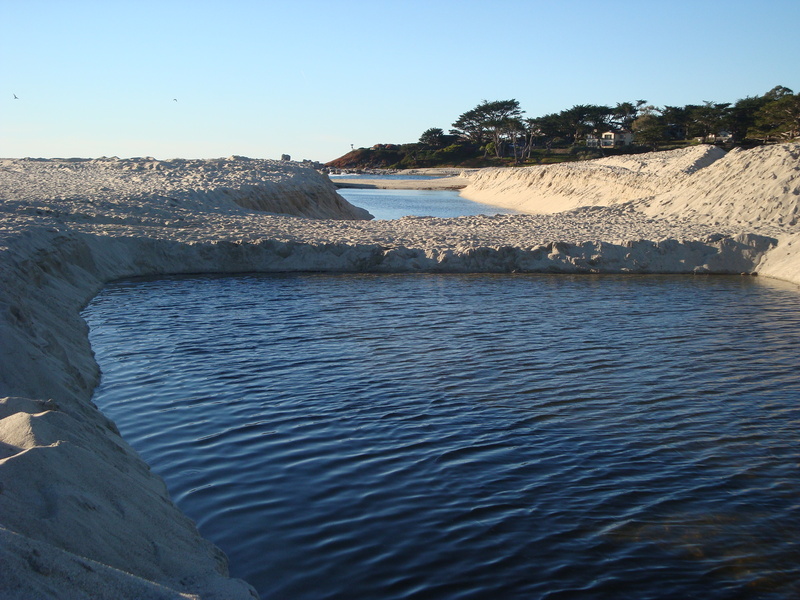 For years now, Monterey County Public Works has been using bulldozers to breach the sandbar separating the Carmel River Lagoon from the sea every time the water level gets high enough to threaten the homes stupidly built on the lagoon-bottom. And for years now, the breaching has caused rapid draining of the lagoon, washing young steelhead (a species federally listed as threatened) out to sea before they’re prepared to survive in salt water. This ongoing management of the lagoon’s water level has taken place under a series of emergency permits, without benefit of environmental review. The County simply waits until the homes are about to flood, then declares an emergency and does the work. By maintaining the fiction that the repeated breachings (at least five last winter alone) are unforeseeable emergencies, rather than an ongoing program, the County has been able to put off doing the studies that will eventually (should the steelhead survive that long) identify mitigation measures aimed at avoiding the worst impacts to the fish. But this year has started off a little differently. Instead of waiting for the traditional “emergency,” the County has begun managing lagoon water levels without, apparently, a permit of any kind. While this might sound like a step backward, it may actually be something of an improvement over past practices. 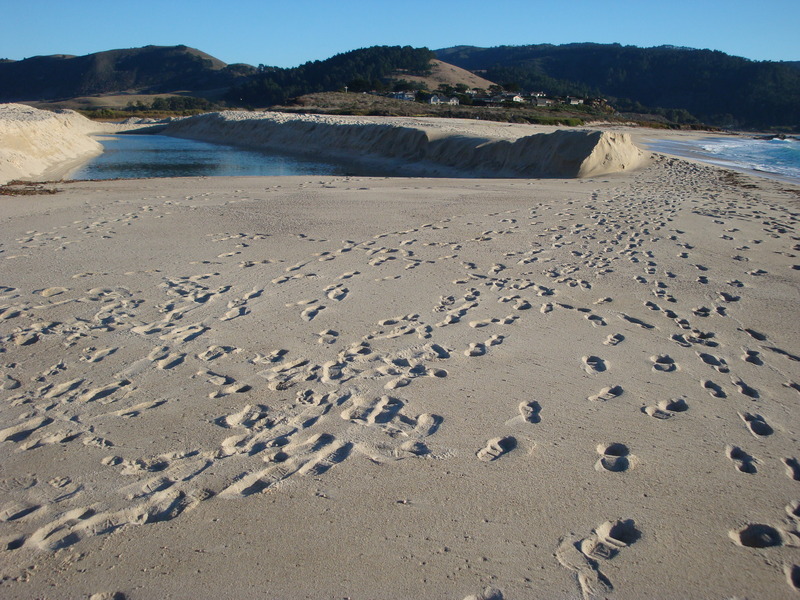 By making this year’s first cut before the water rose to problem levels, the county had time to consult with the National Marine Fisheries Service and the Carmel River Steelhead Association and engineer a cut less likely to result in an abrupt draining of the lagoon. While a northward trending cut may be the best angle from the point of view of the fish, it is not without risk for Public Works. The northward angle has traditionally been unpopular with residents of Scenic Rd. who fear the river will expand the cut further north and undermine the sand dune supporting the road. While this can easily happen naturally, if it happens this year Public Works, rightly or wrongly, will now surely be blamed. So we congratulate Public Works for being willing to stick their necks out a little to help the fish. We just hope that in the uncertain world of wind and wave it all works out the way they hope. Predictably, the ocean has already rebuilt the sandbar at the mouth of the cut. This entry was posted on Monday, November 29th, 2010 at 9:17 pm and is filed under Carmel River, Coastal Development/Erosion, Fire, Flood & Apocalypse. You can follow any responses to this entry through the RSS 2.0 feed. You can leave a response, or trackback from your own site.